This was not the final game that we wanted, but with a much depleted side the writing was on the wall, that is not to say that everyone did not give of their best and there was very little difference in the final scores, with an overall loss by only nine shots, and with the Lions scraping home by only two points it could have been very close. I must say well done to Ernie, David and Sheila for securing our win with some heroics on the last end. Hard luck but well done to The Challenger team this has been a steep learning curve. Let this result take nothing away from what has been a successful season. I hope you are all as pleased as I am with your efforts and that you cannot wait to go one better next time. One could be forgiven for thinking that summer had arrived early, this was a lovely morning for bowling and we were not disappointed, there were some great games and as the final score suggests things were swinging either way. The scorecard shows that we held sway on two rinks but had a tussle on the others, nevertheless, a win away from home is always a good result, well done everyone. Hard luck to our lady challengers, a tough game on a difficult rink. We are now close to the end of our season and our final game will be away to the Opals on the eighteenth, watch out for the team sheet. Good luck to Greg in Cyprus. So near and yet so far, winning on two rinks and losing on two by one shot, sometimes there is no justice, but credit to everyone including the opposition, this was a great morning of bowling and everyone did their best. Well done to the Challenger Team who came away with an honourable draw. The season is now in its final stages and I can only say how proud I am of the whole side for their efforts. I would also like to thank our caterers for an excellent meal. 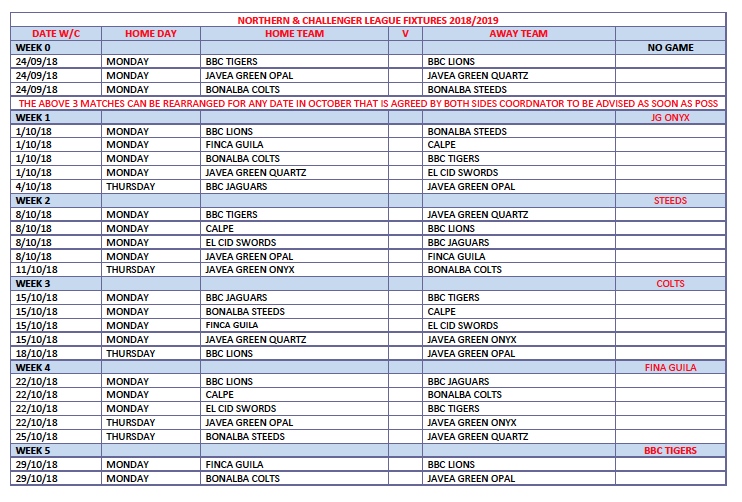 Our next game will be away to Finca Guila on Monday 4th March, please make your own travel arrangements. The team sheet will be E mailed very soon and a prompt response would be appreciated. This was a beautiful spring morning at Benitachell and I think that everyone enjoyed the bowling. As things turned out we came away with the win, there were moments when it looked like being different, but everyone dug deep and we gained a valuable eight points. It should be pointed out however that our opposition did have the advantage of having practiced on our green in the Friendship Cup a few days ago. I must thank our new ladies team who played in the friendly game and had a good win, we will see them together again. Thank you to Petra and Adriana for a good meal. Our next match will be on Thursday 28th February when we will entertain the Javea Onyx. I do not have to remind anyone of that awful day before Christmas when we played them at Javea. Vengeance is mine sayeth the Lord. But he will only be watching, so it is down to the rest of us. Well done to Peter, Trefor and Mary. That should end the report. Everything after that was downhill, it is quite simple, if you do not compete, and we didn´t, then you lose. You cannot blame the green or the wind or the luck, on the day we were simply not good enough. It is no good looking at others, we must all look at ourselves, this is the second time we have caved in just at the time when we needed to do well. To dwell on it won´t help, so I am off to get a drink. 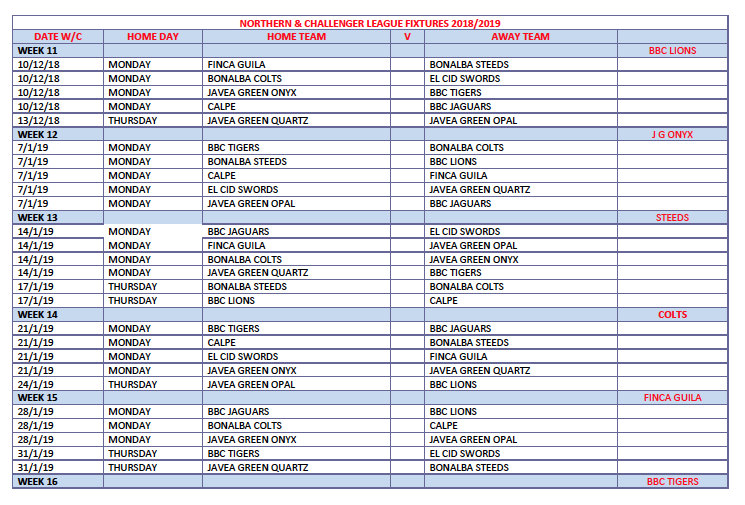 Next week we are at home to Calpe, we must see a vast improvement. On an overcast day which always threatened rain the whole side performed brilliantly. Because of tragic circumstances and absentees we had to do some hasty rearranging, but the way everyone played gives us some indication of the determination of this whole squad. I think I can say with some certainty that once we got going the result was never in doubt. The scorecard tells the story. Hard luck again to the Challengers, but losing the first five ends put you behind the eight ball. We now have a week in which to relax and watch the progress of our nearest rivals, before we travel to Bonalba to play the Steeds on the 11th February. There is a list in the cabin for those who wish to attend our end of season lunch. Please include any guest that you may wish to bring, I will use next week to find a venue and a date. As I said earlier, at this stage of the season every point is critical, today the Tigers answered the call and achieved a maximum with a good shot difference. Everyone did their bit, but there were some strange goings on in the early stages. I will be the first to admit that the Jaguars are struggling for match players at the moment, but like the man said you can only fight the guy standing in front of you. This result now puts the onus back on the Lions, but I am sure they will respond later in the week. Unfortunately the Challenger team came down to earth with a bump, but every game is part of the learning curve. This was a changed side for the Tigers as we wanted to blood some new people and try different teams, things worked out fine and our skips were happy with the new set up. I will post the Team Sheet early next week when a quick response will be required. Sorry for the delay, but I have had a Fibre Optic installed, some may say not before time. We went into this match still smarting from our last visit to Javea Green, however there was a little bit more determination this time, but we are still starting too slowly in some games and having to come from behind. The weather was kind and so were the gods, this was a good all round performance from our teams resulting in a hard fought win. Any win away from home has to give us satisfaction, and this means that we are still in the fight. But there are some tough games ahead and we must continue to improve and maintain our focus. Next up are the Jaguars, I do not have to tell you what is required. This was a satisfactory start to the second half of the season which just keeps our noses in front. On the whole this was a good solid performance in a match that, to be fair we did expect to do well, and we only came unstuck on the one rink. Hard luck to our re jigged challenger team. Our next game will be a much sterner test against the Quartz, who defeated us at home in our earlier meeting, and considering our performance at Javea before Christmas we will have to dig deep. But if we can maintain our present form we should do well. I am sorry for the delay, internet problems. There is not much that I can say about this debacle that has not already been said. We arrived like Tigers and left like Christmas Turkeys. Everyone can have a bad day and this certainly was ours, just at a time when we needed to do well, we must now put it behind us and re group in the New Year. However we still sit at the top of the league, let us pull together and make sure we stay there. Well done to the Challenger team for a win at last. Today was a day when the weather made us all realise why we came to Spain, on this December day the sun shone, and it shone on the Tigers. In the past we would have been happy to take points from the imperious Lions, but for this Tigers side anything other than a victory, is not an option. It matters not which side the Lions put out, they are formidable opponents and a win is to be cherished. Today there were some admirable performances, some games were straightforward and others were hard fought. 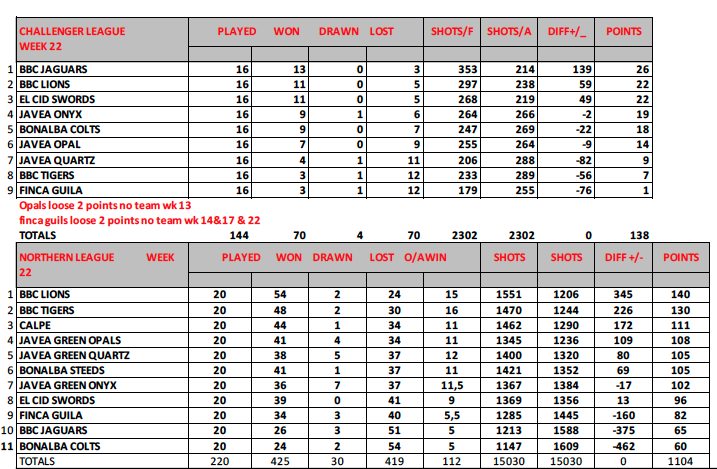 In all league games much depends on the luck of the draw, but at the top level no game should ever be considered easy. Hard luck to the Challengers, you came so close. Our final game before Christmas will be against Javea Onyx on Monday 10th December. I will inform all participating players asap. Following a few late changes this turned out to be a good day for the Tigers, but there were a few hairy moments before we found our feet and secured the win. The wind was making accuracy difficult and positive shots were the order of the day. With the exception of Greg and his team on rink one we were all having tight games, but we came through in the end. A good day´s work, well done everyone. Hard luck to Jak and the Challengers, who once again came up against a three that could have played in the main side. We are keeping the Lions in our sights and it should be a good contest next week. For today´s game Mary and I were unfortunately forced to be a spectators, leaving your Vice Captain Malcolm to organise things, this gave us the opportunity to observe the play on all the rinks. Some of our play was excellent, some not so good, we felt that in the games we lost our concentration dipped and some of our shot selections could have been better. But in fairness to the opposition they played very well. On all the rinks the ends won were very evenly shared, but as the scorecards show, dropping shots at critical times let us down. Having said that a win is a win and a useful six points, well done. Our next game is against Finca Guila on Monday and a revised team sheet will be sent out very soon. To describe this as a good result would be an understatement, it was a great result. As anyone will know, to come away from Calpe with a win takes some doing, to get eight points is something special. As is my way, I will not dwell on individual achievements as this was a whole team effort with people playing at their best for each other and the team. The scorecard shows the final scores, but behind them were some great performances. Well done everyone you were brilliant. Our next match will be at home against the Opals on the 22nd November, circumstances dictate that there will be some enforced changes. Malcolm will be Captain of the day. I know that all those selected will give him 100%. Before the start of this match we had a chat and we agreed that the Steeds would come out fighting, and they did, after ten ends we were down on three and behind on the shot difference, but as Rudyard Kippling said. If you take a Tiger by the tail! This was a very good recovery when we showed what we are made of, well done everyone. I will let the scorecards tell the story. Well done to the friendly team, a good result ( thank you Linda for stepping up). Our next match is at your favourite venue, Calpe, we will endeavour to select an appropriate side for this fixture and I apologise in advance for any disappointments. This was our rearranged game which was on a cliff edge, because of absentees, we just managed to scrape a side to play, thank you to everyone who turned up. The game itself was strange in a way, as one of their players said, we played like the home team. Everyone dug in and we came away with a great result. As the score sheet shows we only struggled on one rink, but our guys were up against a strong team and they did really well to hang on and secure the shot difference. Looking ahead to when all our squad is available, it is not going to be easy to pick the best teams and there will be disappointments. Unfortunately our Challenger team once more came unstuck and their confidence has taken a knock. 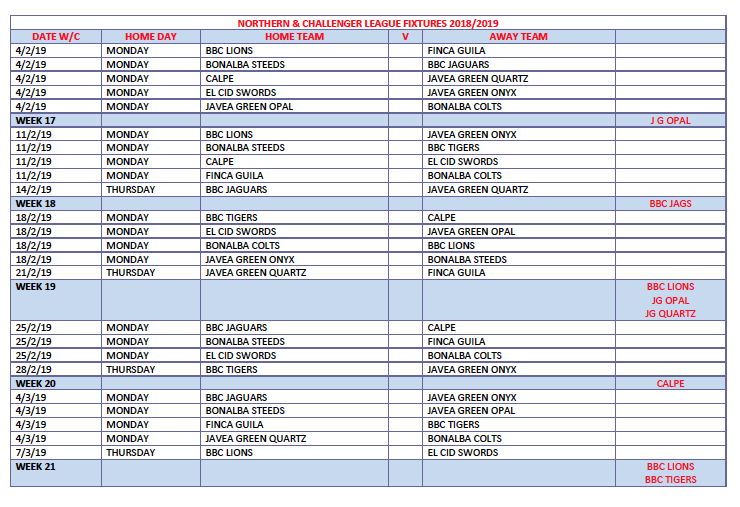 We now have to wait until 5th November to entertain the Bonalba Steeds at home, you will see that they do not have a Challenger team and it is unlikely that they will have a friendly. Coming on the back of a good win against the Lions, one could have been forgiven for thinking that this would be another good team performance, not so. Lynn and her side provided much sterner opposition and we had to fight hard to gain the points. Winning on two rinks and losing on two meant that only the shot difference decided the outcome. 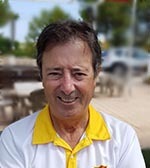 I have to mention Ernie Pope, Alan Guest and Joyce Pope who came back to win well by fifteen shots when trailing after ten ends. Then we had Mary Cockell, Bob Bailey and Linda Smith who led from the start and ran out twenty seven to thirteen winners. Hard luck to the Challenger team Jak Logan, Rebecca Langan and Margaret Bailey who led nineteen to eleven after fourteen ends but lost a bit of concentration towards the end losing by one shot. Well done to the friendly team, Linda Thompson, Patti Sprawson and Jennifer Nesteroff, a sterling performance to win by twenty eight shots to fourteen. To the rest of us, the naughty chair beckons, tries hard but must do better. 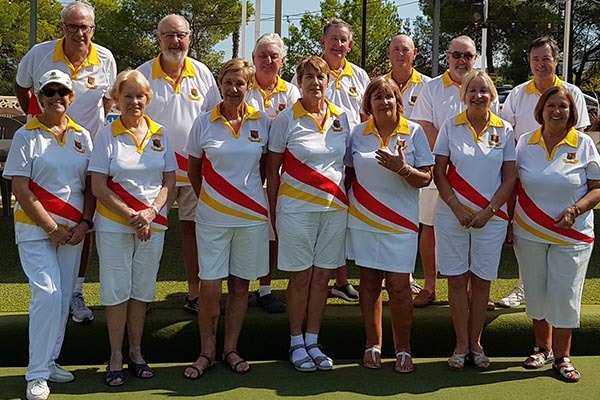 Our next outing will be at El Cid on Tuesday afternoon 23rd October, due to possible absentees the teams will be chosen over the weekend, watch the board and keep a check on your E mails. I would be true to say that prior to today´s game both sides have had a disappointing week. It was important therefore that we both bounced back. This was a match that could have gone either way right up to the end, with a drawn game and two very close results, only one game decided the shot difference. Well done to all you Tigers for coming back so well and commiserations to the Challengers who, had it not been for a hiccup on two ends would have secured the points. Our next game will be on Monday 15th at home to the Jaguars, we will play the same squad but there could be some positional changes. I will also try to play a friendly team, otherwise the Jaguars may wish to bring two of their own. To put it mildly this was a pretty poor overall performance, some will say that many Javea players were playing on our green at the weekend, but that is no excuse for going down at home. Some of our bowling fell well short of what is expected, the scorecard does not lie. We managed to salvage three points due mainly to a last end six to earn a draw and a good win for Greg and his team. On the bright side there was an excellent win for Jak. Rebecca and Margaret in the challenger, well done, our friendly team put up a good fight put just came up short. We next meet the Lions on Thursday and things will not get any easier, but when your down the only way is up and to quote Scarlett, tomorrow is another day. The first game of the season away from home is never easy and Bonalba is not the easiest place to start. However the Tigers handled the situation well and earned themselves a good win. As the result sheet shows there were some pretty impressive scores, I will not single out individuals as this was always a team effort, but I must say hard luck to the Challenger team who did well against some of their top players. 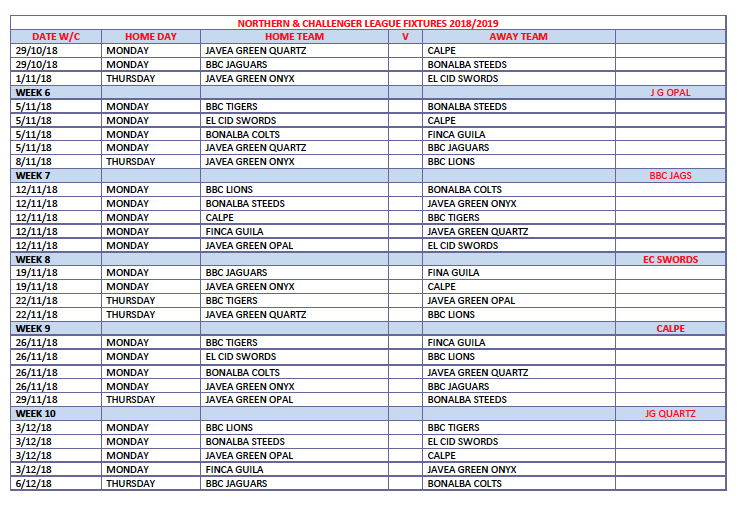 Our next home game is against Javea Quartz next Monday. This will quickly be followed by a Thursday game against the Lions. Unfortunately there will not be a friendly game in this fixture. Does that sound right? I am sure you know what I mean. As we said at our meeting we will play the same team for the first two games, then look to give others a chance.